Korean Argan Oil Thermal Steam Hair Mask Repair Dry Rough Damaged Hair Made From Natural Ingredients - 30 gm - Luxury Beauty Care Products ! Directions : 1. Thoroughly wash hair, make sure your hair clean and fresh 2. After wash, slightly dry with a towel to absorb excess moisture 3.Open the pack and put the mask cap on the head, according to the head size adjust the cap to prevent sliding and massage by the finger tips 4. The essence will be self-heating and will build a steam heating deep absorption effect. Nourish damaged hair and repair scalp tissue 5. Wait for 10-15 minutes, then take off the hair mask and dry the hair. 6. Hair care procedure is completed and the repair effects is better than doing hair treatment in salon. 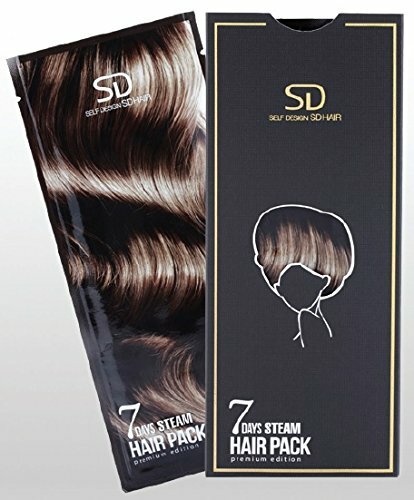 Recommendation: Use hair mask for 10-15 minutes per day each week to maintain health and to improve hair quality.Korean Innovative Thermal Steam Hair Mask contains a variety of moisturizing ingredients and natural extracts. It offers a variety of nutrition for the hair, provides hydration and improves overall condition of the hair. Highly recommended by Korean TV program "100 people selection" as well as designated by the Korea Model Association . The name of the mask 7 Days indicates that the positive effect after the use of mask lasts for 7 days.